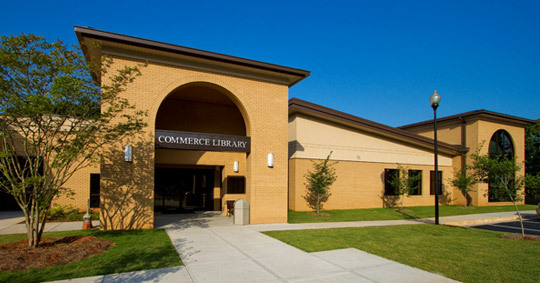 The original Commerce Public Library was a modest, rectilinear building, later enlarged with a curved, windowless addition. The result was a disjointed building, with little connection to the historic downtown nearby. The proud City of Commerce needed an updated 21st century library with more computer access, and it wanted a civic building that tied into the commercial main street neighborhood. The program called for a lively new Children’s Library, donated by the Neelagaru family, while providing for the preservation of the popular History and Genealogy Room. 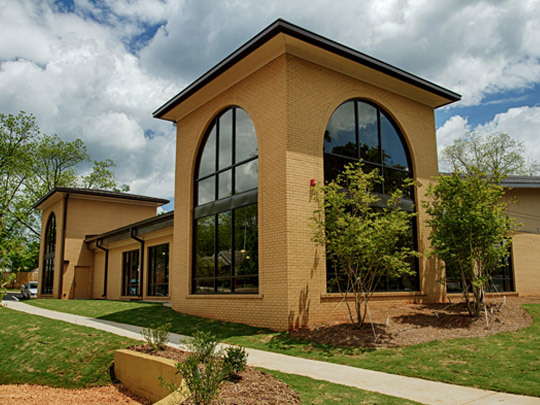 The existing 8,970 square foot library underwent an extensive renovation, and a new 5,790 square foot library addition created needed space for additional computer stations and children’s areas. Ponder & Ponder, Architects brought the disparate parts of the original building and earlier addition together with this most recent addition, into a comprehensive whole. The new main entrance is highlighted with a tower and faces the rear parking, from which most library users approach, while the street-side façade addresses the sidewalk and visually opens the library interior to pedestrians. Interior uses were re-arranged to maximize function: the Circulation desk was moved to face the entrance for better staff supervision; the low-ceilinged existing building was converted for the more quiet functions, including the Genealogy center and Reference collection; the Children’s and Young Adult areas were moved into the dynamic addition, with large windows and new computer access terminals.